Hair loss is a major issue because it not only a complex medical condition but also affects every aspect of the sufferer’s life. Here is good news to the people of Sheffield because we provide resources and support to those who are seeking out solution to hair loss problems. We cover different types of surgical and non-surgical hair loss treatment that is tailored to your specific needs. The thinning of hair on the scalp is called hair loss. Hair loss is also known as alopecia that occurs gradually and referred to androgenic alopecia. In androgenic alopecia heredity and androgens and male hormones is needed to develop the condition. Some other types of hair loss are talogen effluvium, traction alopecia and alopecia areata. Hair loss can happen to both men and women with age however, it is typically pronounced in men. Younger men and women who are losing their hair, hair transplantation may not be the good option for them. Alternative to hair transplantation, non-surgical hair treatment can give best and long-term results. Such treatments are minimally invasive and pain-free that grown in popularity in Sheffield these days. Due to advancement in products and technical skills of an experienced surgeon people are now being able to swim, sleep, shower and carry on with their life right after these treatments. Some of the non-surgical treatments are PRP therapy and mesotherapy. Treating hair loss is not easy because there are very few and effective treatment available. The traditional methods that are used from generations to generations to cure hair loss do not provide effective results. One of the most scientifically approved and recognized treatments for hair loss is surgical hair loss treatment. There are many types of surgical treatments such as FUE and FUT hair transplant that are carried according to the requirement of an individual. Situated in the heart of the medical district in Sheffield, our modern clinic is the ideal environment to discuss your treatment needs. Free, on site parking is available in front of the clinic and we are just a few minutes walk away from the city centre making us easily accessible however you decide to travel. Nu is proud of the clinical expertise and client services that we offer. The clinic manager, Joanne, has worked in the cosmetic industry for over 5 years and has extensive knowledge in hair loss procedures. 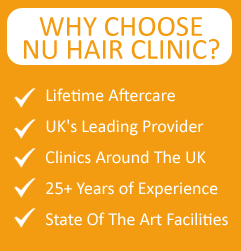 At Nu Hair Clinic Sheffield, you can access the best free consultations with expert surgeons to ensure you have all the information you require to make the decision that’s right for you. The Nu Hair Clinic in Sheffield is proudly climbing the mountain of success with its strong team of professionals that are present here. They possess in depth technical knowledge about the different kinds of hair loss treatments. The way they approach their customers and deal with their problems throughout the treatment process, is really commendable. Joanne is the clinic manager here. She is performing excellent work with her valuable experience of over 5 years in the cosmetic industry. She ensures the proper welcome of all customers and also giving them the best solutions. We have become such experts in providing both surgical and non surgical hair treatments that we have almost created a monopoly in the task here. Therefore hair transplant for men and women in Sheffield and the surrounding places means resorting to only our New Hair Clinic in the city. We have the best surgeons in the world who have tremendous expertise in the job. Our dedicated pre operative sessions and post operative nursing leave no room for error in the treatments. In case of the non-surgical treatments also we are able to deliver miraculous results. As our fees are comfortably affordable, so we are rapidly increasing our satisfied customer base daily. Our surgeons perform the surgeries so artistically that there are almost no residual scars left behind. The most popular surgical hair treatment in our clinic is the Follicular Unit extraction (FUE). This treatment is mostly suggested for hair thinning and baldness problems. In this process, the surgeons plant unit hair follicles from a hairy zone on the scalp to the barren areas. Similar processes are followed in case of facial hair transplant and eyebrow restoration treatments. The results of these surgical treatments are visible only after 9-12 months of the surgery. Our non-surgical treatments like Mesotherapy and Platelet rich Plasma Therapy are also widely demanded in Sheffield.